Unlike last year, this year I got a few cruising pictures! Good morning! I’m sitting here, in the truck, enjoying a cup of coffee, while listening to the raindrops on the roof. Even though I love the sound of rain, this is not a good outlook for our Cruise through the Woods morning. 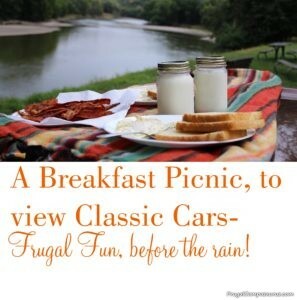 We love our frugal, picnic breakfast outing, but sometimes the weather does not cooperate. While watching the classic cars parade by, on their annual Cruise through the Woods event, some years we are chilly, some years we are cold and wearing winter hats, other years we are hot from the sunshine, this year we are wet. 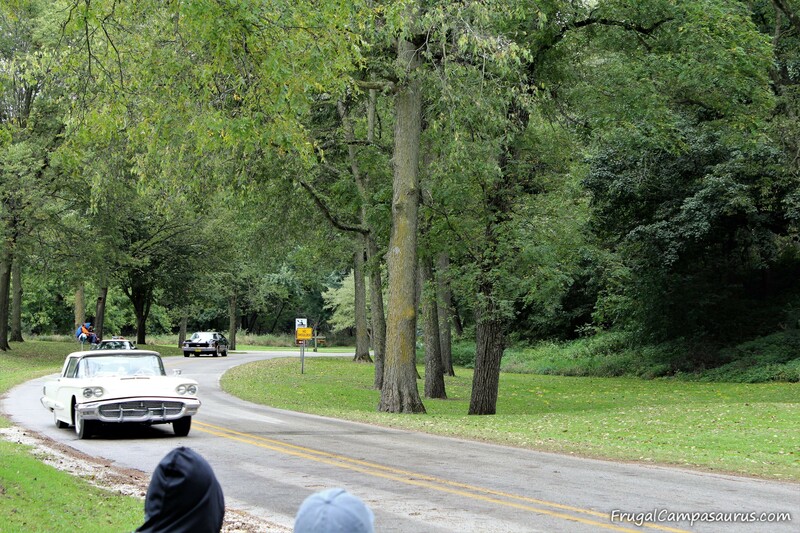 The first Sunday in October, there is a car show in Fort Dodge, Iowa. Many cars parade or ‘cruise’ 30 miles from Stratford, Iowa to Fort Dodge and then park for the Cruise through the Woods car show. The cruise and car show started 34 years ago, and has grown from 75 cars to almost 1,400 last year. 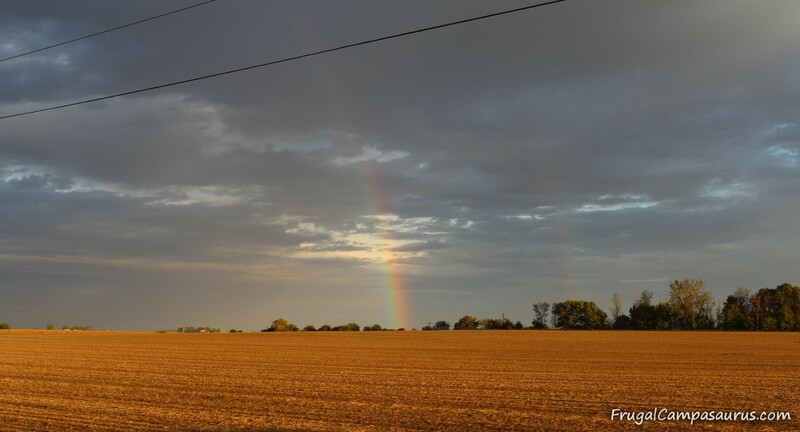 Cars come from all over Iowa and surrounding states. 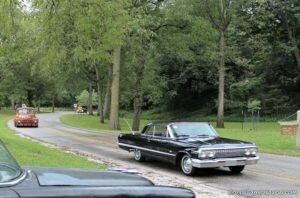 Not all the cars go on the cruise, but there is a large amount that do. While we don’t own a classic car and I am still wishing for a car with fins, it is neat to see all the different models and years of cars drive by. The cruise gets a large mix of older and newer cars and trucks, even a few rat rods and older panel vans. 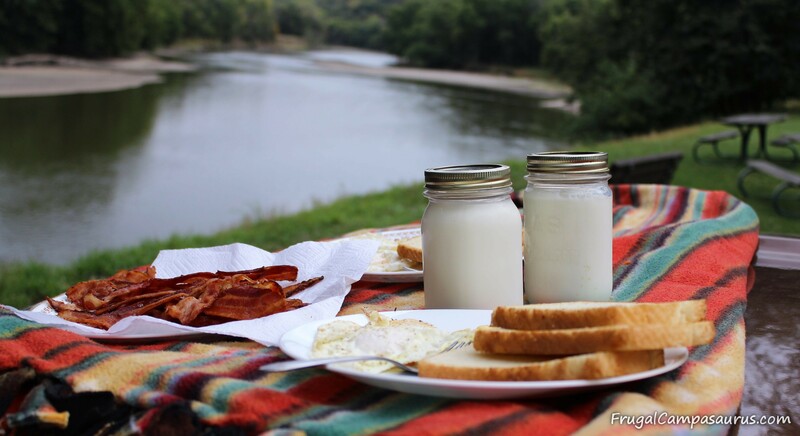 For a frugal, fun outing, we enjoy a picnic breakfast that morning. We arrive early to a park on the cruise route, enjoy breakfast by the river and then spend the rest of the morning watching the cars drive by. Thankfully this year, we were here early, before the rain, to cook and eat breakfast. 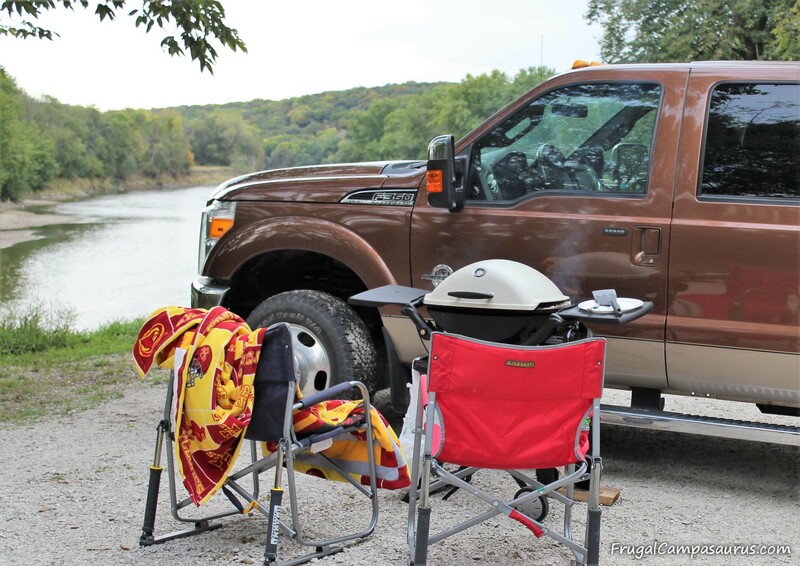 It was a windy morning though, and so we used the truck as a wind block for the grill. I am glad we didn’t get bacon grease splatters on it! This year we cooked on the grill. It is bigger than the old green coleman stove we usually use, but the griddle fits better on the grill. 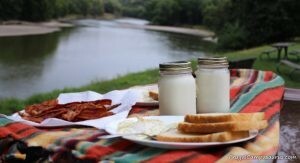 We enjoyed a bacon, eggs and toast breakfast, sitting next to the river. Since there is not a plug-in for a toaster along the riverbank, we are getting used to Texas toast on the grill. I actually like it, as long as it is not soaking in the grease. I tried two different ways to make the Texas toast-buttered on both sides and totally unbuttered. After frying them on the griddle in a little bacon grease, I could not tell the difference. Guess I can save the butter and not use it for Texas toast! I might try to convince the husband to use the old green coleman stove next year- I ran out of coffee again! I thought I was all prepared; I made an extra pot of coffee at home. I poured one pot into my coffee thermos and one into a small igloo. It was chilly, so the hot, hot coffee was good! Unfortunately, the igloo didn’t keep the second pot hot. Probably why it says ‘don’t use with hot liquid’. Next time, I want to bring the camp coffee pot and cook my coffee on the stove! Just starting to rain, but we can still sit outside! Next year though, in addition to a camp coffee pot, I want to bring the camper! We drove through the campground, before setting up to make breakfast. It was early, but some of the families were headed out to the campfire with pie irons. That would be a great breakfast! The campfires smelled so good as we were driving through. I would love to camp at the park on the cruise route next year. 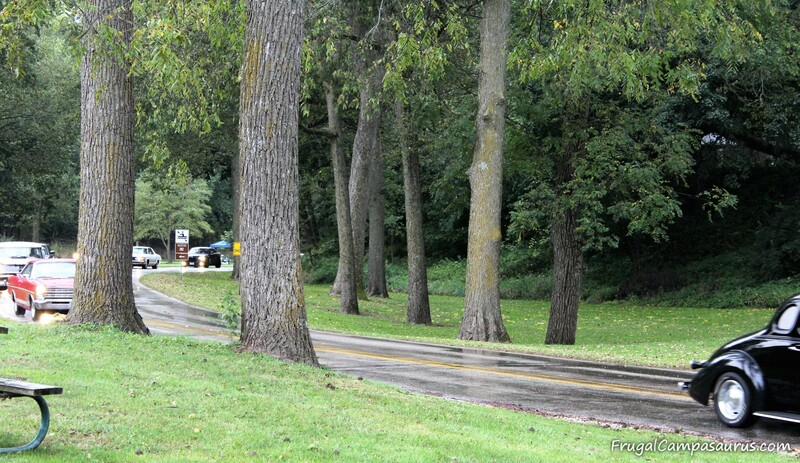 We could just carry lawn chairs down to the roadside and watch the classic cars cruise by. Maybe the kids would even join us watching the cars for a little bit, then they could head back to relax in the camper. Right now, if they would join us, they are stuck for the whole 4 hours we are there. So they never join us. It is just a mom and dad outing, which is also fun. What a pretty surprise as we left home! Right now though, it is still raining. We have moved from watching the classic cars in the back of the truck, to under the trees, to inside the truck. I hoped that the rain would stop, so we could sit outside again. We have already had 2 nice surprises this morning and I had hoped that the surprises would continue with the rain stopping. 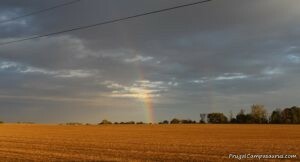 Our other surprises: there was a rainbow when we left home and three deer when we entered the park! 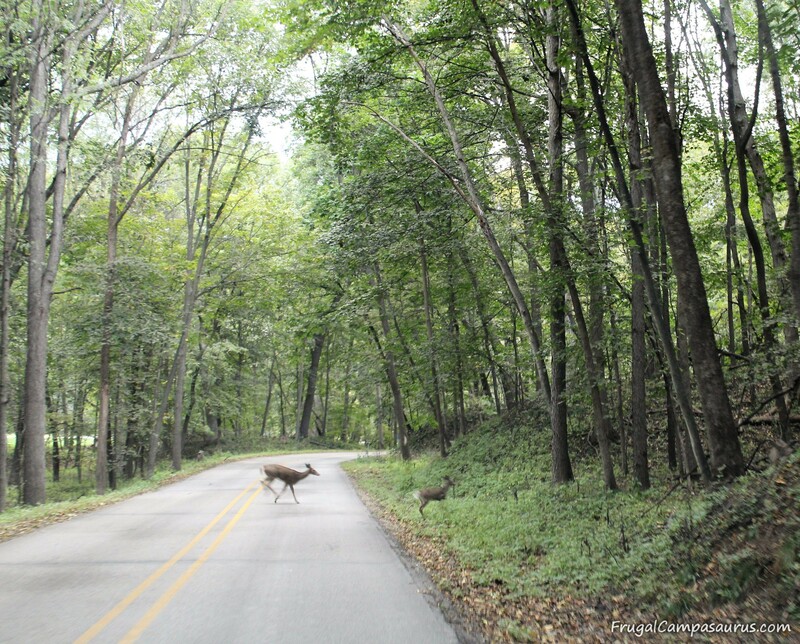 Another surprise- there were actually 3 deer in the road at the park! Well, the rain didn’t stop, but we still enjoyed watching the classic cars. We also enjoyed our frugal, picnic breakfast. It was a great outing: easy, fun and frugal. 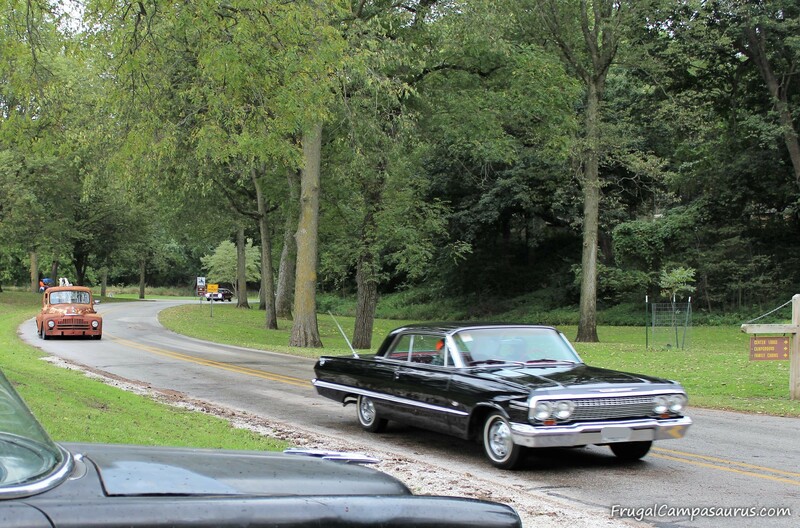 I hope you find events that you can enjoy this fall, maybe a car show, auction, fair, flea market or city event. Maybe you can even include a breakfast picnic, though I hope you can bring enough hot coffee! Happy Camping (or enjoying the rainy weather)!